Greatest Threats: Poaching for the food and traditional medicine markets of northeastern India and the Far East. This species is under immense harvesting pressure, with an estimated 70,000 turtles poached each year in India alone for foreign markets. 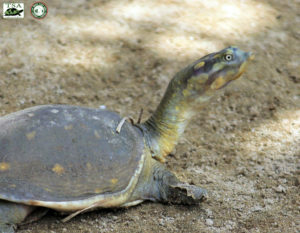 At this rate, the turtle’s endangerment status could change rapidly over the next decade. 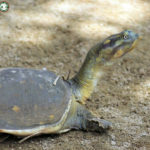 How you can help: Our TSA-India program is on the front line of combating the harvest and trade of India’s turtles. We regularly provide law enforcement with critical information, train law enforcement officials in identifying and handling smuggled turtles, triage and provide long-term medical and husbandry care for turtles seized from wildlife trade, and provide community outreach. You can help us further these activities and expand our impact by supporting our India Campaign TODAY!